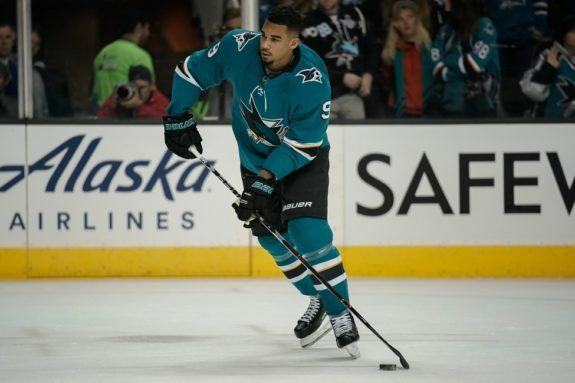 Should the Vancouver Canucks Target Evander Kane? 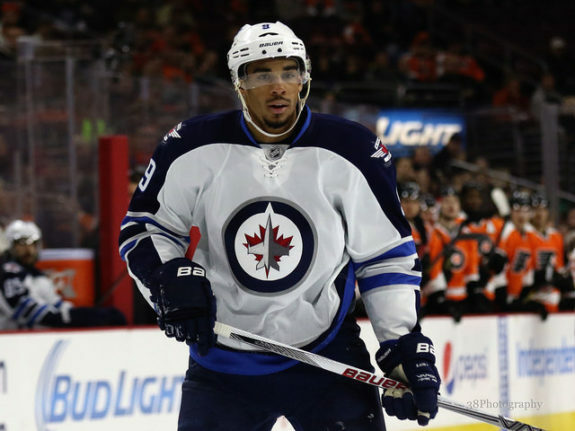 Should Canucks Target Evander Kane? On Saturday Night, Vancouver-native Evander Kane joined CBC host Scott Oake on After Hours. Fresh after helping his Sharks claim victory 5-3 over the Canucks, Kane was fed question after question regarding his childhood in Vancouver, time with the Vancouver Giants, and even tweets referring to the possibility of him joining the team he grew up cheering for. Kane, who recently had his first career four-goal performance, is up to 10 points in nine games with his new club. Acquired at the trade deadline from the Buffalo Sabres, the 6-foot-2 left winger is hoping to play in the playoffs for the first time in his career. The 26-year-old will be an unrestricted free agent at the end of the season. He has garnered attention from the Canucks in the past, but the Sabres’ asking price was believed to be too much. With Daniel and Henrik Sedin’s contracts expiring come July 1, there will be a huge void in Vancouver’s top-six forward group. There will be a plethora of cap space available for the Canucks this offseason, and Jim Benning has longed for more speed, size, and skill in the Canucks lineup. If there’s anything that the left winger is, it’s all of the above. Fact is, Kane would immediately step in and become the best left-winger on the Canucks. As of today, he is third from the 2009 draft class in even-strength points, trailing only Matt Duchene and fellow UFA John Tavares. His 25 goals this season matches his total from last year, and is only five short of his career-high of 30. For a team that again is among the league’s worst in putting pucks in the net, a player like Kane could be exactly what the Canucks need. What About the Off-Ice Issues? Of course, it isn’t Kane’s on-ice abilities that people question. As a matter of fact, Kane was basically exiled out of Winnipeg, with a timeline of indiscretions with the franchise that can make you shudder. Yes, he was talented, very young, and making millions in the NHL, but with his trade to the Sabres in February 2015, there was hope that he was going to take the next step in his development. He has long been a vocal character on social media, and has definitely rubbed some people the wrong way. But after witnessing his one-on-one with Oake, it seems Kane has matured, and perhaps is ready to take on a larger role with a new team. As a nine-year veteran in the NHL, Kane should be more than capable to become a locker-room kind of guy and big-time performer. Perhaps the best thing to happen to him is that he was traded to the Sharks at the trade deadline. In being surrounded by A-class veterans such as Joe Thornton, Joe Pavelski, Logan Couture and Brent Burns, Kane should be able to learn how to be a professional hockey player both on and off the ice. Does It Make Sense to Sign Kane? At the moment, the Canucks have nine forwards signed into next season, four restricted free agents, and five unrestricted free agents. That also doesn’t include some of the notable prospects waiting in the pipeline. Therefore, the Canucks should already have some competition up front for next season. That being said, Kane is an affordable and skilled 26-year-old power forward who is coming into his prime. The opportunity to add such a player doesn’t come by every day. Yes, some teams will be scared to acquire Kane’s services due to his reputation. For Kane, this could be a tremendous opportunity to prove people wrong and do it in his hometown, of all places. Truthfully, the Canucks do need help up front. If the Sedin twins decide to retire, there are two massive openings in the top six forward group, as well as on the top power-play unit. A guy like Kane would immediately bolster the team at even-strength, however, would not necessarily require the power play time to go with it. That massive opportunity could be given to another young player – say an Adam Gaudette or Elias Pettersson – if they are worthy of making the Canucks roster next fall. I may take some heat for this, but I do believe Kane would be worth going for come July 1. As mentioned earlier, to be able to acquire a 26-year-old top six forward via free agency is a rare opportunity to have. It’s not like chasing a certain 30-year-old named Loui Eriksson. The bigger and more important point I have to make is it would take pressure off guys like Bo Horvat, Brock Boeser, and any other potential young guys to make the roster to try to score goals. If the Sedins retire, Kane should be capable of filling the void, as well as help answer any questions that the media may pose. Of course, that comes with a risk, but at this point for the Canucks, it may be a risk worth taking. Thoughts? What do you think? Comment below!